Puzzle & Dragons Super Mario Bros Edition & Puzzle & Dragons Z. Yo-Kai Watch. Nintendo 3ds Console in Excellent condition. Charging dock. Carry case with extra stylus. Trending at AU $103.54eBay determines this price through a machine-learned model of the product's sale prices within the last 90 days. 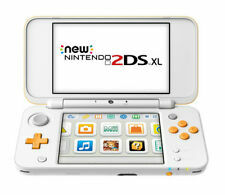 NEW NINTENDO 3DS XL. BRAND NEW BLACK W/CHARGER. The Legend of Zelda Majoras Mask. Bulk bundle including 2 x fantastic condition 'new' edition 3DS XL Consoles plus charging cords all in excellent pre loved condition, have been very well looked after by our boys who have sadly outgrown them. Everything works as per normal, wifi works as shown in photo. It is in excellent condition and works perfectly. Blue Nintendo 3DS console. 1 x 3DS Blue console. 1 x 16 GB class 10 Kingston SD card. 1 x Stylus. • Aqua moto racing 3D. • Mario party the top 100. • Mario party island tour. • Pokémon Blue version (virtual console). New Nintendo 3DS Console *Brand New* - Black - Bonus 3x Cover Plates. Condition is Brand New. Sent with Standard Delivery - Registered. Brand new in box - New Nintendo 3DS (small for factor). Includes 3 lots of cover plates, also brand new. Rare and hard to find new these days. Games included are Pokémon White, Pokémon Black, Super Pokémon rumble, Super smash bros for 3DS, Captain America super soldier, Mario and Sonic at winter Olympic Games, Teenage mutant ninja turtles and Jake power Firefighter. Games have been used, comes with power charger, 3DS is in good condition. New listingBlue Nintendo 3DS XL Console Blue. Good condition. Blue Nintendo 3DS XL Console Blue. Condition is Used. I have attached phtos to show the condition. Very playable! Screen is in good condition. (Nintendo 3DS XL Black / Blue in perfect condition. 3) Super Smash Bros (No box / manuals). 5 Pokemon Black 2. Blue Nintendo 3DS console. 1 x 3DS Blue console. 1 x 16 GB class 10 Kingston SD card. 1 x Stylus. • Mario party the top 100. • Mario party island tour. • Pokémon Blue version (virtual console). • Star Fox 64 3D. New listingNintendo 3DS XL Console Blue/Black with Genuine Charger + Games! 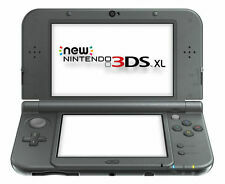 Nintendo 3DS XL Black/Blue Console. Console tested and working perfectly. Nintendo 3DS XL Blue Handheld System (Includes Charger & Case) . Condition is Used. Sent with Australia Post Standard Service. Console is in excellent condition. No scratches on screen whatsoever. black plastic carry case. Fantasy Life. PICK UP FROM KEW, VIC. CASH ON PICK UP. Super Smash Bros. Monster Hunter 4 Ultimate. New Nintendo 3DS XL console Metallic Blue INCLUDES USB Charging Cable. New Nintendo 3DS XL console Metallic Blue INCLUDES USB Charging Cable. Condition is Brand New. Sent with Australia Post Standard Service. Opened but never used, didn't get time to play as we have a Nintendo Switch. Nintendo 3DS Aqua Blue Original Console Includes USB Charging Cable. Has some scratches from normal use, joystick is a bit worn as you can see in photos. Has screen protectors with few bubbles. Has a bit of residue on top screen (as in photos) from previous screen protector that possibly could be removed. Condition is Used. Sent with Australia Post Standard Service. New Nintendo 3DS XL Blue with games. Condition is Used. Sent with Australia Post Standard Service. Pokemon 3DS Console. As new condition. Any questions please ask. This is an American exclusive and only works with American games. (REFERENCE NUMBER: S42094. COLOUR: SALMON PINK. SINCE 1907. Phone us on: (02) 9687 8066. Aceben Loan Office. AT THEIR OWN COST). Stylus - fits into the console. Console - is used but still works fine. The outside is in pretty good condition, a bit worn but nothing is broken or chipped. NINTENDO 3DSXL CONSOLE. Condition is good, just joystick rubber has came of , apart from that perfect working condition (doesnt affect gameplay) Sent with Australia Post Standard Service. Silver Nintendo 3DS XL w/ Super Mario 3D Land, Pokemon Y and more . Condition is Used. Sent with Australia Post Standard Service. 82% larger screens. Colorful accents add style, while the sleek clamshell design makes it comfortable to hold. A new look and ergonomic design. Nintendo 3DS XL Gold/Black Zelda Limited Edition. Condition is Used. Sent with Australia Post Standard Service. Trending at AU $165.76eBay determines this price through a machine-learned model of the product's sale prices within the last 90 days. NINTENDO 3DS XL Solgaleo and Lunala Limited Edition. Reset to factory settings. Red Nintendo 3DS With Games And Accessories. Condition is Used. Sent with Australia Post Standard Service. Nintendo 3DS XL Pokemon Sun and Moon Solgaleo Lunala Edition Complete in box and in fantastic condition with original bags, and box in solid condition. These consoles were the beginning lines when chargers were NOT included. Beautiful crafted detail on the shell the photos do not do it justice. Posted with Australia Post with care and utmost concern so that your item arrives the same way ant collector would expect it. Any other questions please don't hesitate to contact me! Nintendo 3DS Aqua Blue Handheld System. Condition is Used. Local pickup only. Nintendo 3DS XL Metallic Black Handheld System With Game Bundle Includes Pokemon. NEW Nintendo 3DS XL Bundle with games and charger Including Pokemon X and Y , Sapphire and Ruby(sealed), white Mario Kart 7 Sonic And others. See photo. Condition is Used. Sent with Australia Post Standard Service. Make an offer. Listen elsewhere. 6 X Nintendo Consoles. DS Lite X 2. Nintendo 3DS Xl Blue And Black Handheld System. Condition is Seller refurbished. Sent with Australia Post Standard Service. Nintendo 3DS XL Console in used condition. Tested and working perfectly. Sent from Perth area. The Nintendo 3DS launched in 2010 and was positively received audiences around the world. With improved hardware over its predecessor the DS, the system debuted with the new function that allowed the users to experience games in 3D. Several new iterations have been released since launch and only makes the console even better for fun times playing with family and friends. After the initial launch of the original 3DS came the Nintendo 3DS XL, which significantly enlarged the screen size of both top and bottom screens of the system. It had redesigned system buttons and a more rounded feel into the corners for enhanced comfort. The bezels have also been reduced despite the larger size, the buttons have improved feel, and the new screen has reduced glare significantly. A big refresh followed the 3DS XL with the New 3DS and New Nintendo 3DS XL. These iterations had more powerful processing hardware to make games load faster and made games much smoother. It also improved the production of the 3D effect to strain the eyes less and improved the viewing angles on 3D. Nintendo’s strengths lie mostly in its library of fun and engaging games. Take a new perspective of the mustachioed plumber’s world in “Super Mario 3D Land”, or strategise to vanquish your enemies in the 2016 addition to beloved “Fire Emblem” tactics game franchise, “Fire Emblem Echoes: Shadows of Valentia”. Like the company’s iconic Gameboy system the 3DS has a suite of accessories you can buy to further enhance your experience. 3DS and 3DS XL owners can get the Circle Pad Pro for even better tactile feel and control over their games. Protect your console with a variety of soft shell cases for easy transport or collect Amiibos to get freebies in game and unlock new characters.